Nearly all dairy producers have encountered a situation where the animal performance they are achieving is not matching the theoretical performance indicated by their forage quality analysis. Oftentimes, grassy hay/haylage that tests at a lower quality will give comparable performance to a higher-testing legume, or a high-testing legume just won’t produce milk as it should. Nutritionists have, over the years, noticed these trends, and come to generally mistrust the calculated TDN and NEL values which have been based on ADF. University of Wisconsin researchers have also noted these trends and have been working on a better way of evaluating forages for true digestible nutrient content, and thus energy availability. This issue took a national stage with the publishing of the 2001 Nutrient Recommendations of Dairy Cattle (NRC), which changed its recommended way of calculating forage digestibility from an ADF base to one which uses a summative approach. From this information, the correct answer would be that there is no difference. However, what if you knew that your animals can digest 60% of the NDF in Lot #1 and only 40% of the NDF in Lot #2? Because of the NDFd differences, Lot #1 has 7.5 more units of TDN, which could translate into 5 lbs/cow/day of increased milk. With this information it is clear that one would prefer the Lot #1 forage. Calculated TDN and NEL values based on NDF content and NDF digestibility will yield much more accurate predictions of animal intake and animal response than the current ADF-based values. In our example, the ADF-based values overestimated true TDN and NEL for both forages. All this essentially means that switching to NDFd-based values will likely make management easier and improve animal performance, likely leading to increased profit. What is the normal range of NDF digestibility in our forages? The example we just examined is not out of the ordinary, as NDF digestibility can range widely within a given type of forage. As you see in the above graph, the range of values is rather astounding, as forage species, maturity level, variety, growing conditions, and harvest management all factor into the final level of NDF digestibility in a given forage. 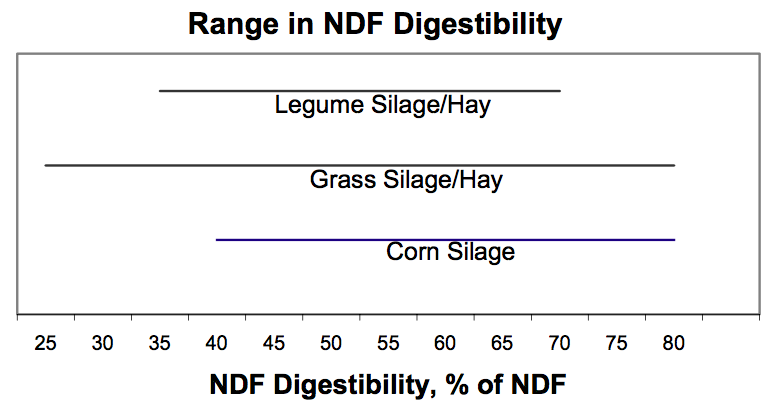 In general, grasses (including corn silage), will have higher NDF digestibility than legumes. However, due to the wider range of harvested maturity levels and types of grass forages that get fed, from grazing leaf growth to feeding straw, the range is extremely wide. Understanding how variable NDF digestibility can be will allow better decision-making when it comes to all aspects of forage management and feeding management. The most important variable is maturity and harvest timing, as the level of NDF digestibility decreases as maturation processes occur in all crops. Forage species is also an obvious factor, but is not something we are willing to change much, although NDF digestibility may be a worthwhile decision point when choosing forage grasses. Variety selection can be crucial, especially in corn silage. All corn silage hybrids tested in Wisconsin are analyzed and evaluated using the new summative approach. In addition, forage quality parameters are summarized into a forage quality index called Milk / Ton. This milk/ton calculation is just part of the equation, as you also need to take yield into account so that you can maximize milk/acre by choosing high-yielding, high-quality hybrids. As an example, brown midrib hybrids score extremely high in milk/ton of silage, but are low-yielding, so are great if you’re buying them from a neighbor on a per ton basis, but not always the best choice if you are growing them on your own land. In-field factors such as stand management, may make a difference in NDF digestibility, as higher plant and stem populations will often lead to differing NDF digestibility. Growing conditions also come into play. Forages grown in cooler climates or time periods will generally have higher NDF digestibility. This is most easily seen in the differences between first cut and later cuts of alfalfa. How do I test, and what should I expect? The NDF digestibility test is now reported on all forage analysis performed by the UW forage labs, either wet chemistry or NIR. Some commercial laboratories also offer similar forage analyses. The test will cost a little more than standard NIR analysis, but the added information will pay for itself very easily. As far as what to expect, the following tables outline the actual range of tested values of the primary forage quality factors. The lowest and highest values of each factor are listed, as well as the average value. These are actual producer-submitted samples, as tested at the Marshfield Soil and Forage Analysis Laboratory. They are not research projects! Forage quality analysis has been improved dramatically with the advent of NDF digestibility analysis being calibrated to NIR analysis techniques. Essentially, it allows us to ignore ADF values and better predict animal intake and animal performance by using TDN and NEL summative equations that much more accurately estimate how our animals will digest a given forage. This article summarizes information presented by Dan Undersander and Patrick Hoffman at the Forage Teaching and Technology Conference, August 30, 2001, in Marshfield, WI and their articles as printed in the proceedings of that event. Their assistance in writing this article is also duly noted and appreciated.